To the surprise of many readers, J rgen Habermas has recently made religion a major theme of his work. Emphasizing both religion's prominence in the contemporary public sphere and its potential contributions to critical thought, Habermas's engagement with religion has been controversial and exciting, putting much of his own work in fresh perspective and engaging key themes in philosophy, politics … and social theory. Habermas argues that the once widely accepted hypothesis of progressive secularization fails to account for the multiple trajectories of modernization in the contemporary world. He calls attention to the contemporary significance of "e;postmetaphysical"e; thought and "e;postsecular"e; consciousness - even in Western societies that have embraced a rationalistic understanding of public reason. 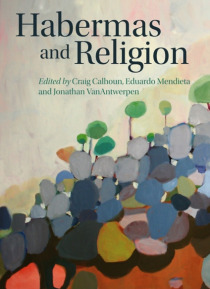 Habermas and Religion presents a series of original and sustained engagements with Habermas's writing on religion in the public sphere, featuring new work and critical reflections from leading philosophers, social and political theorists, and anthropologists. Contributors to the volume respond both to Habermas's ambitious and well-developed philosophical project and to his most recent work on religion. The book closes with an extended response from Habermas - itself a major statement from one of today's most important thinkers.